A small correction to your post. The FLIR One has thermal and visible light cameras side by side in the jacket. It is not using the iphone camera as that is offset some distance from the thermal camera. Image registration at long distances is less of a problem but close-in targets are harder to compensate for unless automatic distance measurement (IR or Ultrasonic) or user manual input is used. The camera that Mu have shown looks like what I would expect from the first or second cut prototype ..... they are supposed to have a really polished case design by now. I see no evidence of such. All looks very weird to me. An amateur looking product with a suspiciously concealed core and no hard evidence of the Mu designed core actually existing. 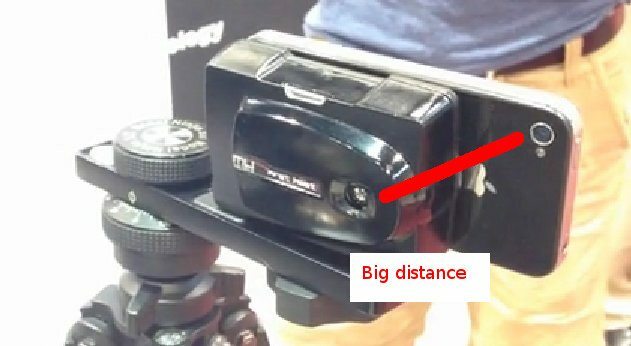 Who is to say that the unit demonstrated is not another companies (expensive) camera core hidden inside a bulky and very ugly case. It does not look very much like the case images used in the fund raising phase does it. If their excuse regarding releasing pictures of the core is an NDA, I call bull**it as even FLIR are willing to place decent images of their cores and micro-bolometers on their public facing web site. 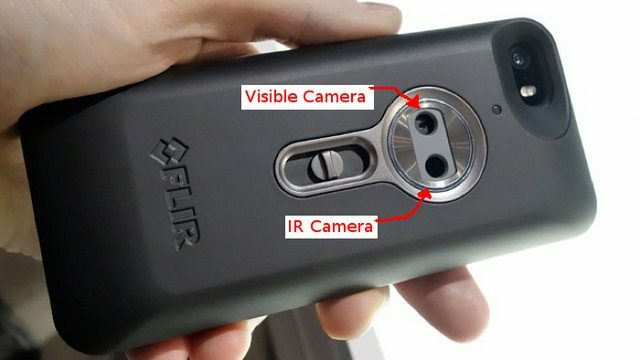 Compare the FLIR One alongside the Mu prototype and spot which is the the ugly duckling from a company that is struggling to produce what they promised. And then there is this prototype 'launch'...... a very strange affair....you build a claimed ground breaking new cheap thermal camera and then you present it at an event that is almost guaranteed to give you the lowest industry exposure.....suicidal idea of very clever.....you decide. The fact that Mu did not release the identity of the event would suggest to me that they hoped to claim public demonstration if challenged, but without any knowledgeable people actually examining the camera too closely. If its a smoke and mirrors or underhand demo, they would not want to be too exposed. This still smells very fishy to me. I wonder how many backers are still on board with Mu ? The FlirOne does not use the iPhone camera for it's purposes, it has it's own visible camera right next door to the iphone one. Ummm, OK. Errm. In what way exactly? >Ummm, OK. Errm. In what way exactly? OH, I see now. I thought that second hole on the FLIR body was for an auto-focus or something. I thought they were using the iphone built in camera for the visible image because they so obviously left a hole for it on their device, and since the iphone 5 already has a perfectly good camera, I thought naturally they were using it. Sorry for the delay in getting you videos of the show on Wednesday. I had a long drive back home. John told another person who came to the booth that the camera would be ready before the end of the year. Although the lag is very visible in my video, there were times of very fluid video. Of course, I didn't film that so take it as you will. If Mu is transferring IR via WiFi that would explain the lag - the BBC Click! show has just followed a presenter doing WiFi stuff in a nightclub, and despite the technical nous of all involved, everything went just fine in practice and died horribly when they did it for real because of so many phones trying to do WiFi all at the same time. The show is surely the worst place to demo a WiFi comms link! The normal video, OTOH, is coming straight from the sensor and streamed straight to the screen in the normal way, hence no lag. The interesting window mix should therefore be lag free in movement of the window and overlay of the video (which it is) but still exhibit awful update rates of the IR video. I am not saying it works or that it's not a fake or anything like that, BTW. Just pointing out that there are valid excuses for some of the symptoms we are seeing. OK it's a surprise they showed something but this has done nothing to convince anyone they will deliver anything anytime soon at their target price. If anything the opposite - just one manky looking prototype after all this time. John gave me the feeling that he would deliver a camera at a clearly cheaper price than the FLIR ONE. I believe he said as much, but I'm going to err on the side of caution. Getting from prototype to market, however, is one of life's great (engineering) challenges. John gave me the feeling that he would deliver a camera at a clearly cheaper price than the FLIR ONE. I think he's probably the only one that believes that. "We have also ordered the internal plastic injection and metal tooling and have actually received critical first article parts, which have tested with flying colors. The housing tools will be kicked-off in the next week or so and we anticipate first article parts within 30 days, upon which we will begin alpha production." Yet the case in the video's looks pretty shonky, maybe 3D printed but it's hard to tell. Would be relatively easy to make a working but clunky prototype with the amount of money they pulled in but still don't see how they will meet the price point with the promised specs. by any stretch of the imagination UNLESS they are now trying to embark on sort of weird ponzi scheme. So did anyone who was at IMTS see more than just the one prototype unit mounted on the tripod? Or do we see any others in the photos or videos that have been made public? Not that it makes much of a difference to them actually being able to ship to any remaining backers with whatever funds are left... like Mike said above. This seems like such a weird place to do the first public showing. At such a large (mostly unrelated) show they would be almost invisible. Maybe that was partly intentional, except surely they knew people would go hunting for them. With regards to the positioning of the cameras and alignment, I think it is safe to say it won't be easy to align for short range work. It will probably fine for building inspection, which has always been their primary target I think. This seems like such a weird place to do the first public showing. From what I have seen and learnt about thermal imaging cameras over the past few years of repairing them, at the base level, they are actually not that complicated. The clever stuff is usually the signal processing to achieve the best possible image from the collected data. If the camera is not for accurate radiometric use, its measurement accuracy becomes less critical and it may not even need a temperature read-out. Such versions are used for SOLAS and weapons sights where temperature differentiation is required and not spot temperature measurement. The Microbolometter is the key to success here. If you can source a microbolometer with decent resolution and performance, at an affordable price, you have overcome the first significant hurdle. You then need a half decent lens. These used to be extremely expensive due to the Germanium that was used to create them. With the advent of new special glasses that may be moulded the price has dropped significantly (but they still aren't cheap). Microbolometers are a controlled product, n=both commercially and in terms of dual use technology regulations. That makes them pretty hard to source unless you have the appropriate credentials. They are also expensive when compared to a more common CCD chip. Once you have the optical and detector block mounted you need to read-out the values from the microbolometer and process them. An ADC may be external or internal to the Sensor assembly dependant upon the part sourced. The 'clever' stuff is in calibrating the microbolometer output and flattening the base line response using Non Uniformity Correction. A simple calibration shutter was used but more complex modern designs are able to work without such. As Mike has shown, if you are able to read-out the data from the sensor, you can manipulate it as you wish. The LEPTON is an advanced design in that it has been highly integrated by FLIR and much of the hard stuff is done for the designer. What must be remembered here is that FLIR had the knowledge and money to design such a sensor package. Mu do not have such resources available to them and were so say using a commonly available sensor that had been on the market for some time. If such a sensor actually existed, it would be unlikely that it would be as friendly to use as the new LEPTON device. I called the Mu project bogus when I saw the projected retail price as I could not see how the microbolometer of the specifications given, and the lens assembly, could be procured by them to make such feasible. At the time, no such combination was available at an affordable price for the Mu project. I stand by that view. Even the LEPTON with its high integration and new lens design is costing far more than Mu would have needed to meet their claims .... and it is only 80 x 60 pixels with 9fps. I don't think anyone in the industry thought that a small company could not produce their own thermal camera, provided they were given access to the required controlled technology, it was the projected final selling price that appeared unrealistic. It is my personal opinion that Mu should have produced a pretty reasonable thermal imaging product with the money and time that they had available to them. It is also my personal view that they did not have enough money to place such a design into large scale production in order to reduce the BoM coats and that the projected selling price of the product was wildly optimistic as a result. A classic case of blue sky thinking escaping the concept phase without someone at the helm managing expectations. And I still say that considering the time they have claimed to have spent on the case....its a damned ugly beast. They have absolutely no excuse for this as creating a custom case of good quality is not rocket science these days and the claims they have made on that topic have not been shown in reality. Much like their whole sorry project really. Not quite - I can't do iphone apps! Yes, but you do know where to hire the required skillset, and as well know how to give them a very detailed set of design requirements, along with a very good level of exactly how the code must respond, and how robust it has to be. I would guess you couls do a decent camera if you could get a supply of the cores for a good price. "The MikeCam" the world's smallest and easiest to use thermal imager. Sounds good! As far as I recall Mike had actually been producing a thermal imager in the past, a sort of a ceiling mounted people tracking low-res one, isn't that true? The result was a 15 x 15 pyroelectric matrix that could produce Pseudo 128 x 128 images by the use of clever interpolation. They released thermal cameras that used a IPAQ PPC as its display and processing. The People counter used IIRC a 16 x 16 matrix pyroelectrric detector array. It was able to track movement within its field of view and analyse the target as valid or invalid. These sensors are to be found in UK shops such as TESCO's, M&S, Sainsbury's etc. The shops use them as customer baehaviour monitoring and for check-out queue management. I believe Mike added an additional PCB that made the sensor heads useable in more varied applications. Mike is better placed to describe his product though. The down side of the pyroelectric detector was its low resolution and the need for a mechanical shutter wheel in static camera applications to refresh the sensor. This is the technology that is to be found in the FLUKE VT04 and VT04. They were designed and built by IRISYS which is now part of FLUKE. A mechanical 50:50 shutter spins in front of the pyroelectric FPA. Interestingly, the VT02 and VT04 contain the latest 32 x 32 pixel Redeye 6A sensor array. IRISYS also make thermal cameras with higher resolution but they use conventional microbolometer technology. This is a commercial product aimed at people-counting , which I reverse-engineered the data format of and added my own board to make the tracking data available. These sensors are to be found in UK shops such as TESCO's, M&S, Sainsbury's etc. The shops use them as customer baehaviour monitoring and for check-out queue management. Actually Sainsbury's (at least my local one) use a far simpler approach to queue management - before starting a new customer session, the screen asks the operator how many people are in the queue! My IRISYS sensor came from the COMET store when that company closed down. What impressed me about the IRISYS product was its built in ability to track movement direction and dwell time so that a shoppers movements around a display stand could be analysed.....big brother may not be watching you, but the shops certainly are..... and not just for anti shoplifting purposes ! Now they gather the same data through iBeacons!